After the men's Virginia Cavaliers lacrosse program suffered its fifth loss of the season to the Duke Blue Devils (19-10) on April 22, many wrote them off as national championship contenders. The Cavaliers' road has been a path not traveled by many. It seems only right that its season ends on Memorial Day at M&T Bank Stadium in Baltimore – as national champions. Head coach Dom Starsia's team beat crowd favorite Maryland 9-7 and captured its fifth national championship. It was the fourth under Starsia and the program's first since 2006. Ghosts still linger after last year's murder of Virginia women's lacrosse player Yeardley Love by former men's lacrosse player George Huguely. Next was the announcement by Starsia at the end of April that Shamel and Rhamel Bratton – both key offensive threats – would be suspended and dismissed indefinitely from the team. Collectively, it was a team decision, headed by the captains, goalie Adam Ghitelman; midfielder John Haldy; and long-stick midfielder Bray Malphrus that the Bratton twins' services were no longer needed on the team. Quite possibly one of the hardest decisions these young men faced proved to be beneficial and necessary in the long run. In any collegiate sport, teammates are an extension of family. This resolution spoke volumes. The road to Baltimore would prove challenging, starting with a first-round overtime win against Bucknell 13-12. The Bratton twins' void would be another player's gain including junior midfielder Colin Briggs and junior attackman Chris Bocklet. TewaaratonTrophy finalist, junior attckman Steele Stanwick was just getting warmed up, making his case for the best male lacrosse player in the country. Led by Rob Pannell, Cornell was a team that was not only a favorite to win it all but a team that the Cavaliers would not be able to overcome. The seventh overall seed disposed of the Big Red 12-9. Denver, the newcomer from the Midwest, would run into a buzz saw against the Cavaliers in the semifinals. At one point, the Cavaliers all but sucked the air out of the Pioneers jumping out to a 10-goal lead. The Pioneers would make a late push in the fourth; outscoring the Cavaliers four to one, but it wasn't enough. Five years removed from its last national championship, the Cavaliers found themselves back at greener pastures. This time, the team would not leave empty-handed. The deck of cards would prove to be a hand that most poker players could not resist. Unseeded Maryland entered Monday's afternoon matchup with an impressive post-season resume, too, defeating University of North Carolina, Syracuse and last year's national champion – Duke. However, it was Cavaliers' Briggs who led the offense with five goals -- roughly 48-hours removed from his suspension. Briggs did not play in the semifinal against the Pioneers on Saturday. Stanwick would be contained to just one assist, a non-factor on the biggest stage. 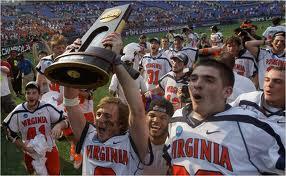 The junior would go onto to total nine goals, 12 assists (21 points) and a lock for the Tewaaraton Trophy. Unlike college basketball, college lacrosse factors in post-season performance. The favorite -- Cornell's Pannell -- exited early in the second round. Tuesday's headline won't recognize the troubles this program has been face with but the adversity it has overcome.